My edition: Paperback, to be published on January 5th 2012 by Simon & Schuster, 288 pages. Description: It's 1996, and Josh and Emma have been neighbors their whole lives. They've been best friends almost as long - at least, up until last November, when Josh did something that changed everything. Things have been weird between them ever since, but when Josh's family gets a free AOL CD in the mail, his mom makes him bring it over so that Emma can install it on her new computer. When they sign on, they're automatically logged onto their Facebook pages. But Facebook hasn't been invented yet. And they're looking at themselves fifteen years in the future. By refreshing their pages, they learn that making different decisions now will affect the outcome of their lives later. And as they grapple with the ups and downs of what their futures hold, they're forced to confront what they're doing right - and wrong - in the present. The premise to this book sounds so fantastic that from the moment I heard about it I couldn't wait to get my hands on the novel. Until I realised that Jay Asher is one of the authors, that is. I read another novel of his, Thirteen Reasons Why, which sounded equally intriguing to begin with but sadly ended up being a big reading disappointment (review here). 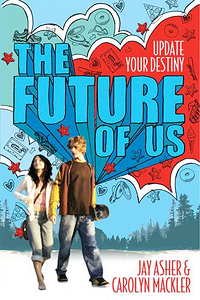 Thankfully Asher redeemed himself with the excellent The Future Of Us. Two teenagers in 1996, Emma and Josh, use a new computer to dial into America Online (AOL) for the first time and stumble across a page named "Facebook". What they at first regard as a clever prank they soon realise is in actual fact a website from the future. And every change in their daily routine they make because of looking at their future selves on Facebook, ripples through time and changes their lives. Literally. I was a teenager in 1996 and as such could very easily relate to the descriptions of the mid nineties; the music the kids listen to, the technology they used (disc man, tapes, the first cell phones and computers) and most of all the way they interact with one another - as a lot has changed in the last 15 years and teenagers are very different nowadays. At times this was funny as they exclaim a certain thing will never happen when in retrospect we know it does. And their confusion about future terminology now so common to us, such as "Facebook", "Glee" and "Netflix", shows how quickly we've adapted to things that weren't available less than two decades ago. We now regard them as if they've always been there, when in fact of course they haven't. The only slight letdown to the otherwise highly entertaining read was the abrupt and predictable ending. There was so much more to explore there, and while I understand that Emma and Josh had to let it go at one point it's surprising they did it so quick and easily. 1996 Emma could've promised herself never to delete her account for instance. And Josh didn't seem very involved from the start though the both of them could've used this to their advantage in more ways than imaginable: invent Facebook before Zuckerberg gets a chance to or use it to figure out winning lottery numbers! I know that all they had to work with were random status updates, but from other events happening it seemed their 1996 versions were able to influence the actions of their future counterparts, so it wouldn't have been completely out of the realm of possibilities. The reader also never finds out if Emma is able to change Kellan's future or how the time travel was possible in the first place. In short: a fascination and well-written novel, but I would've liked it to be longer to satisfy my curiosity. I've been hearing so many things about this one lately! I love books that are one sitting reads. I'm glad you enjoyed it.